After a several year hiatus, the North Council of the St. Johns County Chamber of Commerce has started up again with a mission of providing a means for small business owners in the area to network and learn from each other. Tatro said the Chamber gave the new group a framework to form the new council and by the end of May, the presentation to the board of the St. Johns County Chamber of Commerce was completed and unanimously voted upon to approve the new council. Monthly meetings will be held on the third Tuesday of each month at 8 a.m. at Westminster Woods. Sponsors, who are allotted five minutes at the breakfast to discuss their company as well as a North Council website mention, are sought for each meeting. The new council is launching a membership drive that will continue through the month of July. Tatro said they plan to introduce the concept of the North Council to area businesses as a way to raise awareness of their businesses and to help the community and they are targeting businesses in the Northwest, Nocatee, County Road 210 corridor and World Golf Village. Tatro said there are several reasons that it is beneficial for local businesses to belong to the Chamber, including the opportunity to meet other business owners, access to news and information from the Chamber, networking opportunities and the chance to be involved in the community. Hudson believes that the St. Johns County Chamber, with 1,100 companies as members county-wide, is a powerful force and the North Council has the potential to be a strong one that can really have an impact on the community. 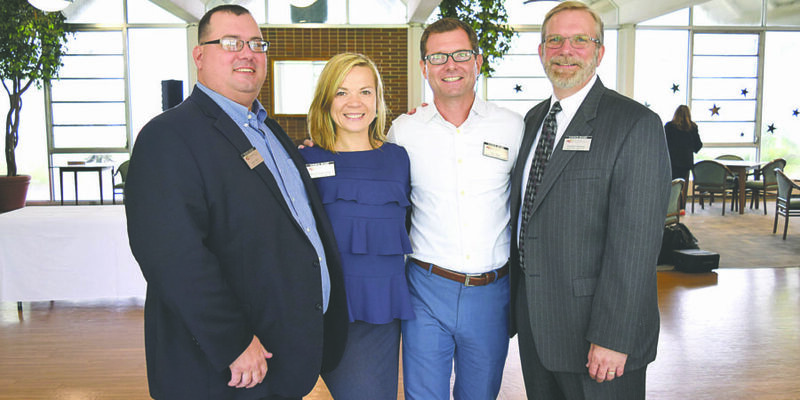 “The excitement now is that we get to go out and raise awareness in the community about how to use the Chamber to grow your business and how to use the Chamber’s resources effectively,” Tatro said. Email Stephen Hudson at stephen@digitalmarkco.com or visit www.stjohnscountychamber.com for more information. The North Council board at the June 20 meeting. Pictured are Jason Odom, Marta Grudzinska, Eric Tatro and Stephen Hudson. Not pictured are board members Amanda Birch and Christopher Thompson.